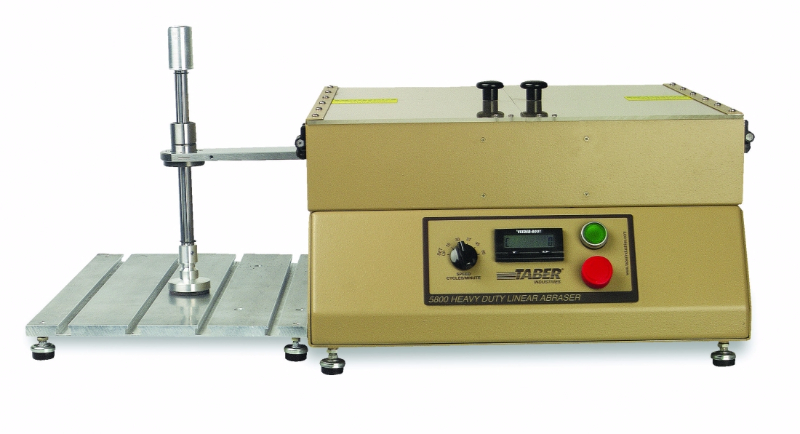 The TABER® Heavy Duty Linear Abraser - Model 5800 is used to evaluate material properties of products with a rugged, durable surface finish that require an increased testing load or longer stroke length. Supplied with the 2" diameter Universal Attachment and Scotch-Brite™ scouring pads, the Heavy Duty Linear Abraser is ideal to measure a coating's resistance to scrubbing with an abrasive scouring pad. A popular application includes evaluating non-stick coatings used on cook / bake ware. Similar to Taber's Linear Abraser, a test attachment is secured to the bottom of a vertical spline shaft and accessory weights may be placed on a weight holder affixed to the top. A precision bearing on the spline shaft creates a "free-floating" test system. As the test arm moves in a linear motion, the "free-floating" system will raise or lower as the test attachment follows the contours of the specimen being tested - curved or flat. The base load of 500 grams consists of the test attachment, spline shaft and weight holder. 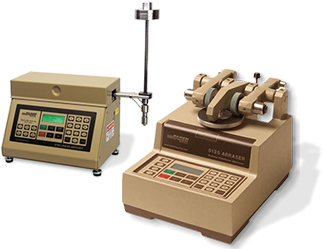 Accessory weights of 1000, 2000 and 4050 grams are included and can be added to the weight holder to increase the test load. With a high torque motor, the Heavy Duty Linear Abraser can accommodate a maximum testing load of 20 lbs. (weight sold separately). Other features of the Heavy Duty Linear Abraser include a slotted roller channel allowing stroke length adjustments up to 318mm (12.5 inch); five preset speeds including 15, 30, 37, 45, and 60 cycles per minute; and an integrated T-slot table for securing specimens during testing. With interchangeable attachments, the Heavy Duty Linear Abraser can also be configured similar to the Linear Abraser to evaluate the relative resistance or susceptibility of a material surface to wear and abrasion, scratch, gouge, scrape, rub, and more. In addition, the instrument can be used for both wet and dry testing. To increase test output, an optional second test arm kit may be added to perform two tests simultaneously. Caution: Not all interchangeable attachments will accommodate the heavy test loads possible with the Heavy Duty Linear Abraser. Tests conducted with the Heavy Duty Linear Abraser using the Scotch-Brite™ scouring pads are normally performed until the surface coating has been worn down to the substrate material or a portion thereof (breakthrough). Alternatively, tests can be run for a predetermined number of cycles (e.g. 10,000) with mass loss used as the end point. The following link provides a listing of test methods the Taber Heavy Duty Linear Abraser (Abrader) satisfies. Please note, additional accessories may be required.